Doublethink #11, by Matt Aucoin. This CCS grad has decided to do a subscription service for his twenty page, two-man anthology featuring fellow CCS grad Kevin Kilgore.Aucoin's video-game influenced line usually doesn't do much for me, but I like the scribbly, tossed-off line he uses for the classic four-panel diary comics in this comic. Kilgore's comics are about his adventures in South Korea teaching English. His line is cartoony but confident and bold, and he lands a number of solid punchlines in these strips that remind me a great deal of Keith Knight's work. The upcoming subscription will serialize a monster story by Kilgore, who hasn't published much in terms of paper publications but is nonetheless talented. I like the way that Aucoin is adapting the Chuck Forsman/Oily Comics model on a much smaller scale, forcing himself to produce work on a regular basis while giving the spotlight to a deserving friend. 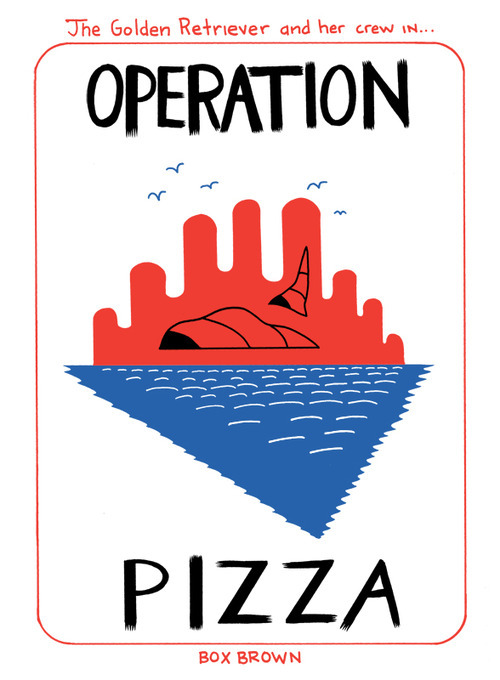 Operation Pizza, by Box Brown. This is a rare all-ages comic by Brown, printed on a risograph at the Sequential Artists Workshop in Gainesville, FL. It's a silly story about the captain of a vessel and his first mate who are trying to explore a bizarre island that stands out for its use of red and blue. They saturate the page when the reader is taken underwater and are otherwise used as spot colors. The story itself is a bit of silliness that involves a pizza tattoo, ancient underwater cave paintings of pizza being worshiped, various underwater sea vessels and funny character design. It's more wacky and nonsensical than funny, but I always love the way Brown uses simple and basic shapes to construct his characters and his settings. Combining that with the way he uses bright, primary colors makes the entire package an eye-catching one, even if there's not much "there" there. Himzal #1, by Anthony Meloro. This is another Fort Thunder-inspired, genre-style comic.Ben Marra is another obvious influence in this story of a man trying to rescue his stripper girlfriend from a slave-trading ring, only to be savagely beaten as a way of getting the attention of the girlfriend's stripper. She happens to be the titular character and a witch to boot. This was quite an enjoyable comic, as Meloro's scratchy line and character design is boxed into a six-panel grid, which in itself is squashed between narrative panels at the top of the page and decorative designs at the bottom. 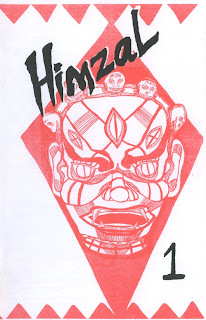 Just when the reader knows what to expect, Meloro busts out splash pages with spot color introducing Himzal, including Michael DeForge-inspired stylized fonts indicating all of the pages she will have to visit. There's a crude enthusiasm about this comic that makes every page worth looking at, lending an added air of strangeness to a story that is otherwise boilerplate in terms of its plot (act of violence, vow of revenge). Meloro has done a lot of fine arts work and it shows in the way he created this comic as an art object, but he still values narrative and the experience of the reader above all else. I'm eager to see more from him. Bird Brain #2, by Bird. 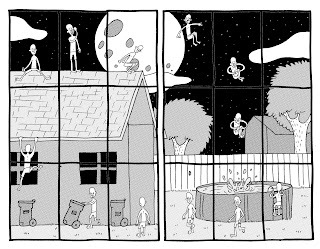 This wordless (save for some pictographs and text on the inside covers) comic is simple in the way it's drawn (likely with a computer), yet it's surprisingly complex in the way it depicts loneliness turning into contentment. It's about one of three roommates bringing home alcohol, only to be rebuffed by the other two, who head out. 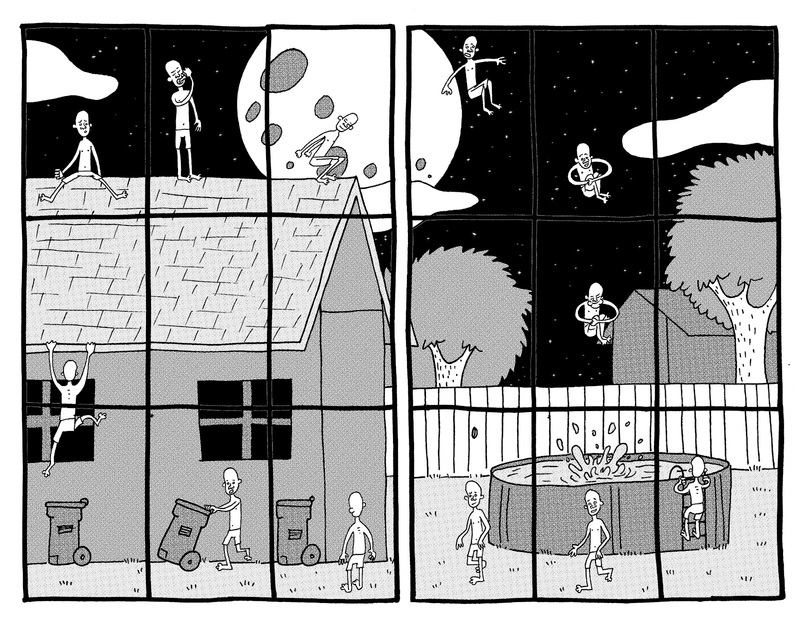 With a split panel style that simultaneously depicts space and time passing, Bird shows us the man relaxing in his outdoor swimming pool, diving into it from the roof of his house. It's a slightly crazy and reckless series of moments that nonetheless unfold perfectly, as he floats in the water and starts to have dreams of weightlessness. The comic ends with an interruption, pointing to the frustration of wanting to connect but ultimately being alone while knowing that we always have to deal with the problem of other people. This is an artist whose line may be unremarkable, even dull, but his understanding of how to put together a page makes all the difference. 3-D Pete's Star Babe Invasion Comics #4, by Mike Fisher. This is another loving tribute to female actresses from cheesy sci-fi and fantasy films from a couple of generations ago. Fisher is a skilled cartoonist and designer whose drawings are both tasteful and attractive. The best parts of this zine are always his amusing rundowns of his favorite old-school sci-fi films and the attractive actresses therein. This issue focuses on the actress Caroline Munro, with a story dedicated to the awful Italian Star Wars rip-off titled Starcrash. With a sharp but relatively gentle wit, he makes fun of the film while praising the loonier aspects of its design and dishing out bits of trivia. Fisher also has a special knack for drawing in a naturalistic style that doesn't deaden the vitality of his characters on the page. Even his pin-up pages are full of life, thanks to the slightly cartoony quality he brings to each figure. 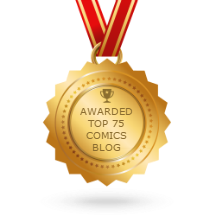 This comic is extremely silly fun aimed at fellow fans of the genre, executed with great panache and enthusiasm.